We think that mass and energy are not interchangeable. Density and volume are interchangeable: if a mass is compressed its density increases and its volume decreases. Compression forces increase material density but not material mass. Compression forces increase energy too as we are going to see. But energy is not mass. Even though it is suggested by a famous equation. For us, Gravity is a force of pressure. We think that gravity is cyclically variable. It increases and decreases periodically. Gravitational fields expand, decreasing their forces of pressure and contract, increasing their forces of pressure, periodically. These gravitational forces of pressure create kinetic energies. For us, orbital motions inside gravitational fields are not inertial. Something in movement, a gravitational flux with a kinetic energy, finds a matter and compresses its mass. This mass will resist being passed through depending on its density. This resistance modulates the gravitational curvature and its periodical variations. When mainstream scientists – I guess that you are not one of them (good news for you!) because they likely stopped reading at the first paragraph (they are not used to thinking without equations and find very inaccurate and really disturbing this kind of text) – speak about matter they are thinking about a very closed model of matter formed by atoms with nuclear subparticles inside it. We do not know if atoms exist or not as a specific amount of matter. We do not know whether matter is or is not infinitely divisible. We do prefer to think simply about spatial densities, matter locations and matter distributions. Because for us, electrical charges, that are supposed to distinguish each material element from the other ones, does not exist in a nucleus inside matter, they are only consequences of intersections of periodically variable gravitational fields and their cyclical displacements. Electrical configurations of different material elements that determine their different material properties are, for us, only spatiotemporal issues. Positive and negative material charges are not anything different from kinetic energies and the forces that they produce created by intersected spaces that vary periodically. It is believed by current atomic physics that gravity has an insignificant value at the atomic level. We think it is not right. “Atomic” weights, “atomic” electromagnetic charges, chemical bonds, strong and weak interactions, Van der Waals and Casimir forces, they all are, for us, consequences of gravitational intersections – entanglements – and gravitational variations. We could discuss here the differences between gravity and electromagnetism, but will put a picture at the end of this post related to this issue. When at least two entangled gravitational fields contract, they create different pressures in their four spatial intersections. These four gravitational intersections can be considered as four dimensions as you can see in the picture below. And these different and temporary pressures will depend on the distance between entangled gravitational fields and their opposite or equal phases of gravitational variation. If you look at the picture above, in momentum 1 the left gravitational field is contracted and the right is expanded. At this moment field 1 is experiencing a higher pressure created by the displacements of the intersected left and right gravitational fields. The left side of the right gravitational field has descended creating a downward force of pressure, and the right side of the left gravitational field has ascended creating an upward force of pressure. The mass or masses that were located in the field or dimension number 1 would have a higher weight. Field 3 has the lowest pressure in that moment, because of the movements of left and right gravitational fields. These movements create opposite forces on opposite spatial dimensions 1 and 3. Field 3 experiences now the lowest pressure. But later, in momentum 2, when the left gravitational field expands and the right gravitational field contracts, the mass or masses that could be placed in field number 1 would have the lowest weight because field 1 experiences the lowest gravitational pressure. Field 3 now has the highest pressure. The picture shows that spatial asymmetries, as different material weights, are correlated with the increasing and decreasing of gravitational pressures that create the gravitational variations. We could say that kinetic energies caused by the variation of those entangled gravitational fields produce different forces of pressure that increase or decrease the weight of matters placed in the dimensions created by their intersections. We could say in a most general sense that kinetic energy produces material weight. We could say in this general sense that kinetic energy increases or decreases material density and decreases or increases material volume. But we can not say anyway that kinetic energy create material mass. We will detect easily material masses if they are placed in the field or dimension that is receiving the higher temporary pressure. But Material weight is not the mass itself, it is not an attribute of mass. The consequences of gravitational variations on field 1 and 2 would have been different if the phases of variation of left and right gravitational fields had been equal. When they both expand and contract at the same time, their variation produces different consequences on each created dimension. We will see it later with another picture. On the other hand, in momentum 1, the created field number 2 experiences a movement toward the left side, from right to left. In momentum 2, field 2 moves toward the right side, from left to right. In each momentum field 2 has inside it a motion with a right to left or a left to right direction, that is kinetic energy too. 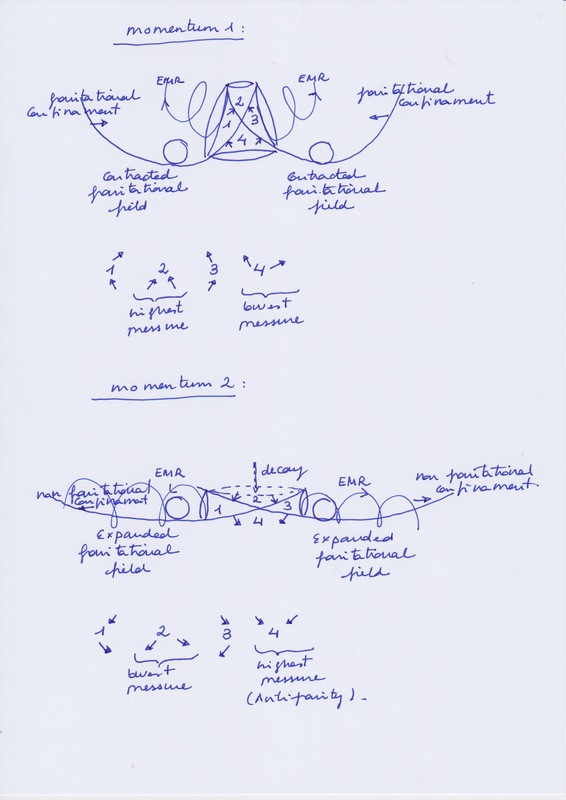 These movements inside field 2 could be named “magnetic”. But the whole field 2 moves from right to left or from left to right at each momentum. Its spacial displacement creates a pushing force that produces energy too. This field 2 is currently know as an “electron cloud” or shared electrons in a chemical bond. This pushing force could be named as “electrical” force. 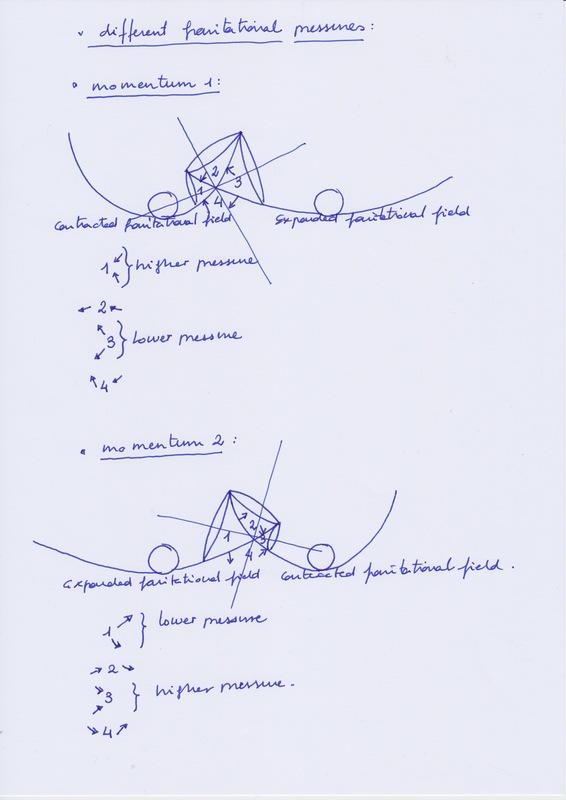 We can not say that those pushing forces of field 2 are created because field 2 is attracted by the matter that has the highest “electronegativity”. “Attraction” and “rejection” forces are, for us, consequences of spatial entanglements and periodical spatial variations. “Electronegativity” is not a property nor tendency of matter to attract electrons. When field 2 displaces toward the left side, it coincides that material masses inside field 1 have their highest weight. And the material mass that created the contracted curvature of left gravitational field – I have drawn it as a circle inside the base of the curvature – will have its higher weight too. The kinetic energy inside field 2 and the kinetic energy created by the movement of the whole field 2 toward the left side at this moment, coincide too with the losses of weight of matter placed in field 3 and the losses of matter that creates the expanded curvature of the right gravitational field. But these energies of field 2 and the forces of pressure that they produce are caused by the gravitational variations of entangled left and right gravitational fields. we can not say that the energy from field 1 and 2 is produced by the loss of mass from field 3. We can not use mass for explaining the conservation of energy. And we can not use energy for justify the conservation of mass although they are related, they are different expressions of the same mechanism. The increasing of energy from fields 1 and 2 is compensated by the loss of energy form field 3. The increasing weight from the masses inside field 1 are compensated with the loss of weight from masses inside 3. We have seen that when masses inside field 1 have a higher weight, they have a higher density and a lower volume, masses inside field 3 have with the same proportion the lower weight, with a lower density and a higher volume. And, periodically, pressure on field 1 and 2 and changes on their volumes are proportional too: when field 1 is contracted field 3 is expanded. Field 3 and material masses inside it has the same kind of opposite relation with field 4. And all these variations depends on the variations of left and right gravitational fields that have an opposite phase of variation. Finally I would like to comment you what we think about the spatial distribution of matter and the infinite interdependence on their gravitational fields. 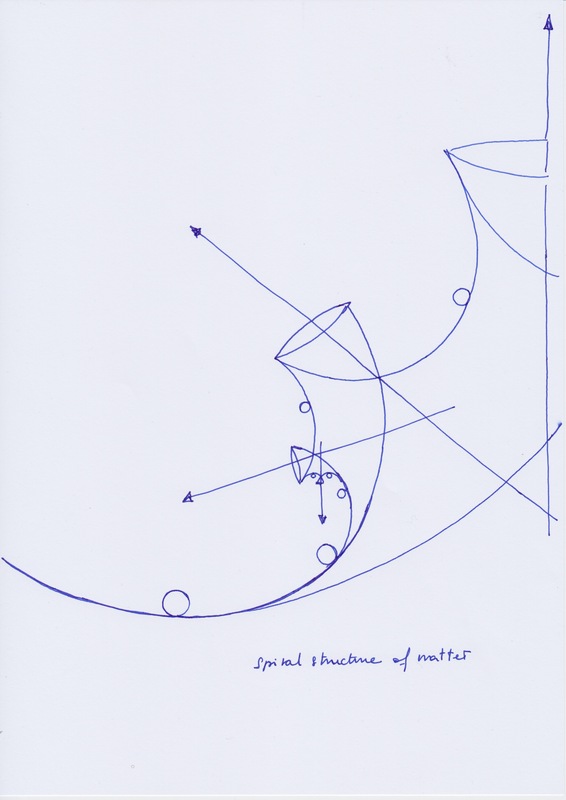 As you can see at the picture below, we think that matter has a spiral estructure. This spatial distribution allow the simultaneous existence of infinite spacial dimensions. Infinitely small dimensions with their infinitely small matters and their infinitely small intersected gravitational fields, and infinitely large dimensions with their infinitely large material masses and their infinitely large intersected gravitational fields. This picture represents for us the spatial structure of atoms and molecules, the spatial structure of stellar systems and galaxies, the spatial estructure of universes… and so on. All these fields are periodically variable for us. Now I would ask you, which of those infinite fields with other infinite fields inside them are electromagnetic and which are gravitational?